A number of South Gloucestershire schools have been visiting the Bloodhound Technical Centre in Avonmouth this month to sample a series of educational workshops. Pupils from local schools including Blackhorse Primary, Almondsbury Primary and Brimsham Green each spent a half day at the centre to take part in a number of taster educational workshops that incorporate science, technology, engineering and maths (STEM). Around 20 pupils from years 3 to 6 at Blackhorse Primary School visited the centre on Friday 22 May, where the morning began with a tour and explore of the Bloodhound supersonic car which is currently under construction at the centre. 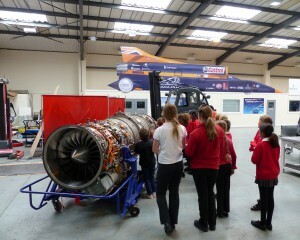 The pupils were excited to see the EJ200 jet engine and other main components of the actual Bloodhound car which will attempt to reach 1000mph in 2016. They also got to meet Bloodhound’s build team and technicians from the Royal Air Force (RAF) and the Army’s Royal Electrical Mechanical Engineers (REME) working on the project, and hear some of the extreme facts and figures involved in the ambitious world record attempt. 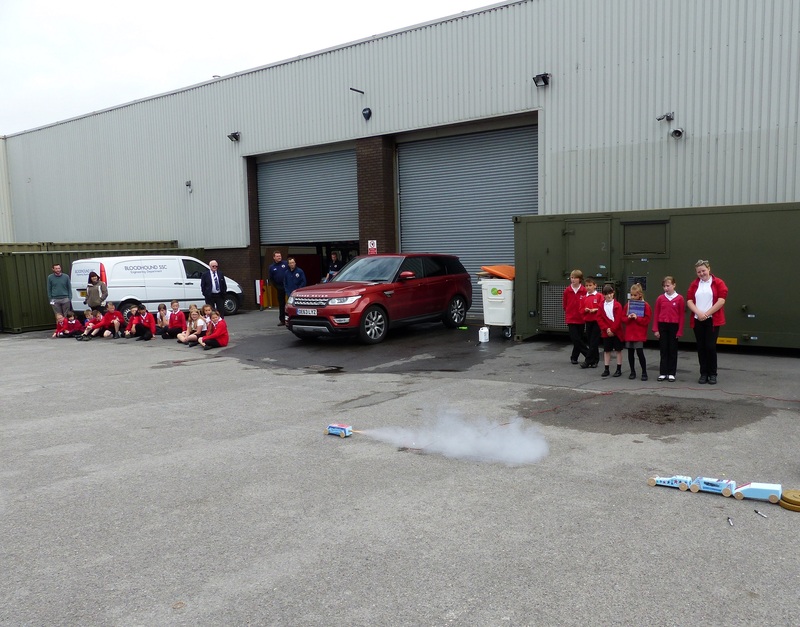 The pupils then took part in a model rocket car workshop where they worked in pairs to design and build miniature race cars from foam blocks which they shaped and refined before going out to the test track area to race them. They learned about chassis design, team work and time keeping with the Bloodhound team using physics, engineering and mathematics to help them understand the science behind what the cars could achieve. Bloodhound’s primary aim is to inspire a generation by creating a unique, high-technology project, focused around a 1000mph world land speed record attempt. The Bloodhound team are sharing this engineering adventure with a global audience and hope to inspire the next generation by bringing science, technology, engineering and mathematics to life in the most exciting way possible. A further series of school visits are planned to take place in June.